Fresh with clay-color clay still in a regrowing contact [3/8" with crystals in there] are a self-standing trio of deep blue shale phantom crystals with included clay for good measure. 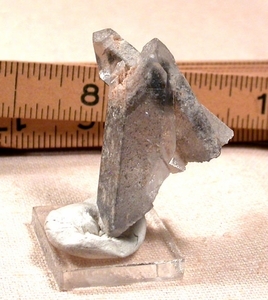 Overall 1-1/4x 1-5/8x 1-3/4" tall, this Arkansas cluster has remained quite clear for all its' inclusions and outer natural etching patterns. A raised record keeper to the vertical crystal can be seen in the second photo.